Today we catch up with Catherine Connor, Inspirational Leader at Aspire Photography Training. Aspire are the supporters of our Food Blogger category, offering a fabulous prize designed for creatives who seek further guidance with the motive to enrich your blogs true potential. Click here to visit the category page and find out more! Catherine regularly inspires us with her own thought provoking blog posts and so we asked her to share her passion for the culture of blogging. Mastering the art of blogging often becomes for so many a soulfully rewarding aspect of storytelling. We are a nation of food lovers, foodies that devour monthly food magazines and recipes in the Saturday and Sunday broadsheets. Rumour has it we simply can't get enough ideas, suggestions, recipes and stories. Our consumer is more and more alert to all styles of food creation – thank you Instragram and Pinterest! Whatever your vibe, you have alongside you a nation of keen readers, and my intention is to encourage you to "Get blogging," sharing and entering awards! Talent needs a stage to shine from, a deserved stage. Blogging is a great marketing tool and a fabulous way of showcasing you, your personality and vibe – your blog is such a fabulous resource, it's a great reminder to those whom you have already served photographically and in business, it reminds them of you and all that you do with the ultimate motive of reminding them of your sheer expertise. You will become both journalist and editor on behalf of your business and that has got to be one of the best jobs in town! You are a curator of all that you do and produce - remember, you are creating an art gallery not a library - your world is all about inspiring people, giving them an appetite to either explore further ideas with you or simply just enjoy it as pure food entertainment. Vibe and personality. All blogs need a vibe, just like foodie magazines have a vibe which will attract their tribe. Decide the blog’s personality and tone – how do you want your reader to feel? What would you like the blog to achieve for the reader, emotionally and physically? What's the purpose? Develop a relationship with your blog, understanding your blog will liberate so much confidence and creativity. You must love visiting your blog, as much as you hope your readers enjoy the visits, your blog must reward your head and heart. 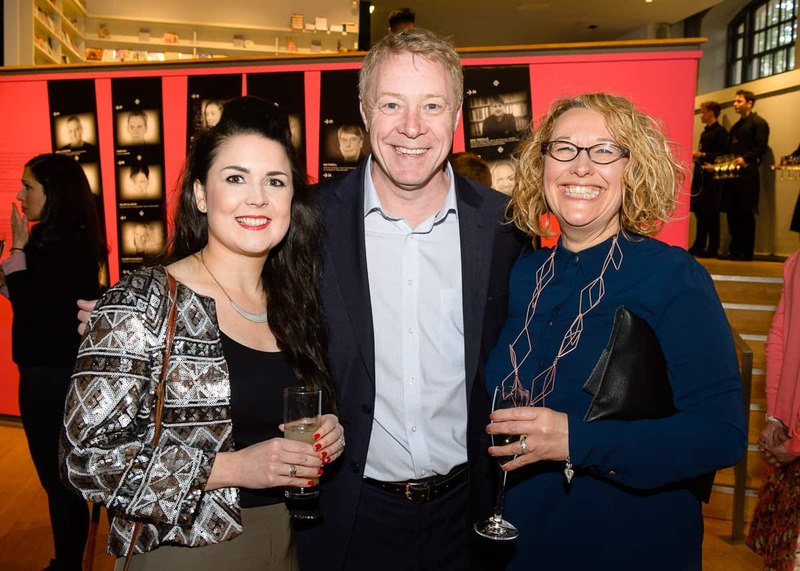 Above: Jenny Heyworth (Aspire Photography Training), Chris Roberts (One Vision Imaging) and Catherine Connor at the Champagne Taittinger Reception in 2017.
Who are you writing for? Become more certain of who your reader is. What do they want each month, what will keep them engaged and entertained? If your mission is to build a reading audience, make sure you share your posts from your Facebook pages, google+ through to your Pinterest boards and Instragram. Sharing will have a vast influence on the relationship you have with your reader. This approach will help you gain a deeper insight into who you are writing for and their interests – build your tribe! You will work very hard for your blog, there is nothing wrong with seeking a little creative reward. Ever felt you deserve something? I believe you do. You deserve the opportunity to become an award winner! All of the energy, effort and stories told deserved to be showcased and celebrated – what are they looking for apart from YOU? They are looking for images that perfectly complement the blog and bring the written word to life. The pictures can be of anything at all relating to the blog, whether it is the ingredients themselves, the process of making it or the finished dish, at home or in a restaurant - whatever the image is that acts as the illustration. Dive in and consider all the possibilities for you and your efforts – just a click of the keyboard away! Do it! I passionately believe in the power of your blog and its influence, so make sure your blog influences you as much as it will influence those that read. One of the most valuable assets you have is your treasure chest of images and your energy for storytelling, make it your mission and motive to show and share as much as possible. Now is the time to ensure you are not the best kept secret! Go and inspire your desired tribe! 2. Create a variety of content which is different throughout the month, reminding yourself constantly of the objectives to inspire and educate your readers. 3. Always share all posts on Google+, Facebook, LinkedIn and Pinterest – it’s all about the reach. 4. Engage your clients by asking them questions and seeking their viewpoints. 6. Don’t forget to boast about your business too by sharing a key selection of your work. 2. Review a food festival, gin festivals which you may be are attending – tell the festival story, reveal what inspired, what's hot and the ‘must taste’ this season. 4. Cover stories showcasing food producers and farmers – the harvest (be inspired by the Bring Home the Harvest category from Pink Lady® Food Photographer of the Year! A feast for the eyes! 6. Explore the ‘do’s and don’ts’, perhaps things to avoid when planning a family celebration. 7. Include an ”ask the expert ” within your blog such as a sommelier’s recommended wine list from the supermarket – can you imagine the fun researching? 10. Incorporate your personal work, hobbies if relevant to your tribe such as your travel photography. Inspired? I hope so – go on, dive into blogging!